Keegan McCarthy, the owner and operator of Coastal Alaska Adventures has lived in Alaska since childhood. Keegan’s Father is an internationally recognized wildlife biologist, who studied bear in Southeast Alaska from the time Keegan was 6 years old until moving on to different studies when Keegan graduated high school. During that time Keegan was immersed in the life of bears, wildlife and the Alaska outdoors. From living in remote research camps to trapping and relocating bears, Keegan followed his Father through the woods his entire life. Keegan spent many years in home school, being out in the field working with his Father too much to make it to an ordinary school. Keegan began hunting with his Father in Alaska at age seven, by age 12 it was not uncommon for him to be off in the woods alone, chasing Sitka deer, grouse, brown bears or whatever was in season. By high school it had become a serious addiction. Keegan and his buddies never missed and opportunity to hunt, and were more often exploring the back woods than in class. With some luck Keegan graduated high school with honors, and was off to college to study wildlife biology. After a year or two of juggling classes, hunting and work Keegan chose to move on and start his career as a commercial fisherman and hunting guide. Keegan began working as a hunting guide at the age of 20, quickly landing a job with one of the top outfitters in the state, Gary “Butch” King. Keegan spent the next six years working for Gary and other well known outfitters around the state. Taking every job or opportunity presented to gain more experience and spend more time hunting. He quickly became well known as an excellent assistant guide and moved up fast do to his lifelong experience hunting in Alaska. When he was not guiding Keegan operated various commercial fishing operations for salmon and crab, using this income to fund his guiding endeavors. In 2005 Keegan began his own guiding operation, choosing the areas of SE Alaska that he was raised hunting and fishing in. He has since guided 70 plus successful Alaska black bear hunts and has built a strong reputation as a bear guide and professional outfitter in SE Alaska. He is an active member of the Alaska Professional Hunters Association, Safari Club International, and holds a voting seat on the Alaska Department of Fish and Game Advisory Committee for the Juneau area. When not busy guiding hunts Keegan still works as a commercial fisherman and sport fish guide. He literally spends more than 200 days a year either at sea or in the field guiding. There are few people who spend as much time in their hunting area as Keegan. We are proud to announce that in 2014, after nearly 20 seasons of guiding big game hunts in Alaska, Keegan McCarthy has been awarded his Master Guide License! We would like to thank all the great clients that helped make this possible and your never ending support of our business. We look forward to the upcoming season and many more successful hunts into the future. This has all led Keegan to have an intimate knowledge of the areas where he operates guided hunts. He knows all the secret nooks and crannies, all the local wildlife, plants and ecology. He works to share a true Alaskan experience, one gained from spending literally his entire life in the areas he will share with you. 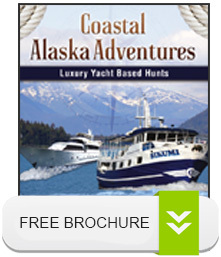 Coastal Alaska Adventures has a very experienced group of talented individuals working as guides, vessel operators, chefs or mates. All of our guides are required to spend a minimum of two years as an apprentice before being allowed to work as an assistant guide. Currently our head assistant guide has 18 years as a guide, and our “newest guide” is on his 5 year working with us. While at times we may have to substitute guides, our core group is highly experienced, attentive and at all time professional. We demand a high level of service at all times, and insure our guides provide the best possible hunt for our clients. 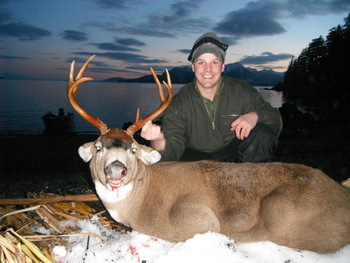 Alaska's leading Hunting Guide and Luxury Outfitter. Copyright © 2017 - Coastal Alaska Adventures - All rights reserved.